The fluid and vibrant animation of this film is of special note; even though it was made the same year as the last episodes of Devilman and Mazinger, it far surpasses them both on a technical level. And General Zannin is the man, as always. If you're a fan of Mazinger Z, you may really enjoy this. I tend to be more of a fan of Devilman and was disappointed by the fact that this felt more like a Mazinger Z special with Devilman as the special guest. I'll try to explain why it really bothered me but it may reveal some spoilers so be aware. (though why you're reading a review of this and haven't already seen it is beyond me). For one Devilman has to be saved by Mazinger Z at least twice whereas it's never the other way around. The devilman villains are pretty much controlled by Dr. Hell (The Mazinger Z villain). You are surrounded by Mazinger Z characters but you only get a quick cameo from 2 Devilman characters. 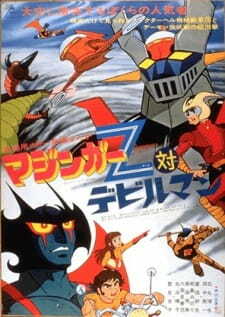 The final battle is a fight between Mazinger Z and the main villain. Even the END credits mostly feature Mazinger Z with Mazinger Z music. Overall this was a very one sided special that did no justice for Devilman, but did plenty for Mazinger Z. The only real positives I can say about it was the beautiful art and animation which is much better than Devilman and Mazinger Z series. If you love Devilman. You may be disappointed. If you love both. You may find some enjoyment.